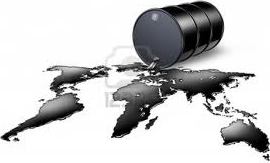 From speculation of international currency wars, to related geopolitical tensions, to the economics of actual supply-demand equations, there is no shortage of theories as to the reasons behind the recent tumble in crude, or if such a decline bodes ill or well for the economy of main street. 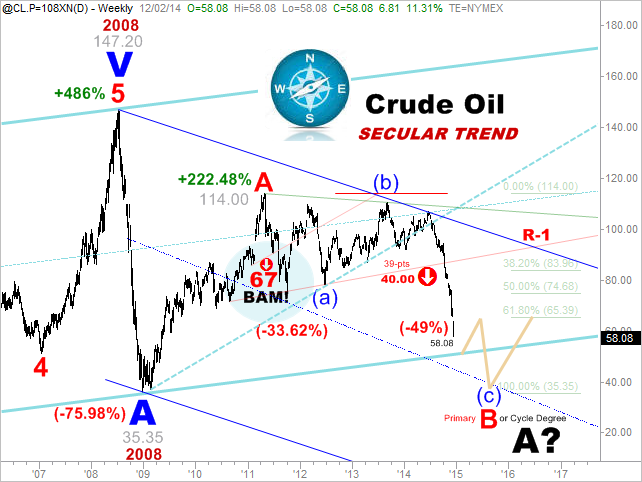 Using price, trends, and two specific measured moves as our guides, in concert with a dose of Elliott Wave labeling, the chart below illustrates the unfolding big-picture overview of the price action in Crude from its crest just shy of $150 per barrel in 2008. Firstly, take note of the circled capture of the $67 dollar per barrel price target (BAM!). That sell signal along with its associated price target triggered in 2011 against the 114 pivot high. Although it took more than 3-years to capture its target, the rising red trendline hovering over the down arrow calling out the 67 level foretold the future price point recently experienced in 2014. Another such sell trigger occurred more recently in 2014. We have noted it on the chart as being worth 39-pts to the downside with a target of $40 dollars per barrel, a virtual retest of the 2008 crash low. This secondary trigger is also set against the pivot high of 114, which simply means that going forward, the target shall remain viable so long as 114 holds its interim pivot high. From an Elliott Wave perspective, until recently, it’s been difficult not to view the 75.98% crash low as a large Cycle-Degree wave terminal (in this illustration noted as the largest blue A-wave). However, it now appears i.e. the large black A-wave in question, that this mega-terminal can shift to a forthcoming low of the current decline contingent upon just how low oil goes before basing. Now that you have a handle on the already developed price action in Crude, you might be wondering how the Chart-Cast Pilot portfolio navigated the last major leg down of this recent bear market decline. If so, you can take a brief look at how the Pilot fared in each of the three time horizons for which it shares position status with subscribers here.